We refer to your earlier forwarded application for job engagement with the Amec Plc, Today our Human Resources Department has confirmed your appointment in our Company considering your resume, on the above subject, the Amec Plc management hereby congratulates you on your successful emergence based on detailed recruitment. Find attachment of the soft copy of the Contract of Agreement, which you are required to read carefully and argumentate where necessary. Upon your thorough review and acceptance of this offer, You are required to Print the last page of this Contract agreement, sign, Scan and send back to us via email with the under listed documents for documentation. Scanned Copy of International Passport. Please include the Scanned Copy of family member passport that would be embarking on this trip with you if any. The company shall be shouldering your work-permit and (family) visa expenses via our licensed Immigration attorney/agent of Office of the Immigration Services Commission(OISC); The Hard Copy of this Agreement Letter have been submitted to the employment attorney for endorsement, the action will be carried out at the Ministry of Works,also the Certificate of Sponsorship is with the Attorney. All Legal processing regarding your entrance will be done here in the United Kingdom where your Contract Hard Copy was submitted; meanwhile deposit is ready on your behalf for your entry clearance documents, the Immigration Attorney will be responsible in handling your files upon the Sworn Affidavit of Oath from the British Crown Court of Justice. The Sworn Affidavit of Oath is a written form of evidence used in court proceedings. The affidavit sets out the facts as you remember them. In legal matters, the evidence wanted for court to hear about your matter must be in a Sworn Affidavit of Oath, Your statutory declaration/statement of fact to abide in this contract and never to neglect The Amec Plc or your job responsibility will be made as your name is being sworn also you will incur the expenses of that at the crown Court,which will be reimburse upon your arrival into the UK. Address: 371 Cranbrook Rd., Ilford, London IG1 4UQ, United Kingdom. You are expected to be sworn an Oath at the British Crown Court of Justice via the Immigration Specialist, Raphael M. Ferguson of the ILFORD LAW CHAMBER UK within 10 working days of receiving this Contract Agreement to proof your readiness to join the Amec Plc and also to enable the Company grant you the expenses on your Work-Permit and Visa Application. Greetings from the Human Resources Department of Amec Plc (UK). 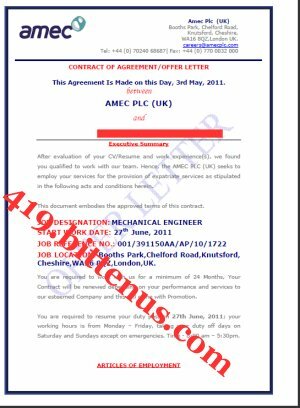 This is to acknowledge the receipt of your email, your Information have been passed on to the Immigration Specialist together with the Hard-Copies of your Contract Agreement Letter with Amec Plc, already petition have been placed on your behalf on Work permit/visa category. Only certified applicants who have been sworn an Affidavit of Oath at the British crown court will be eligible to receive visa and their flight ticket(s).Along with their Benefit statement and two months salary advance payment to support their relocation expenditures. The Sworn Affidavit of Oath is a written form of evidence used in court proceedings. The affidavit sets out the facts as you remember them. In legal matters, the evidence wanted for court to hear about your matter must be in a Sworn Affidavit of Oath, Your statutory declaration/statement of fact to abide in this contract will be made as your name is being sworn an Oath. 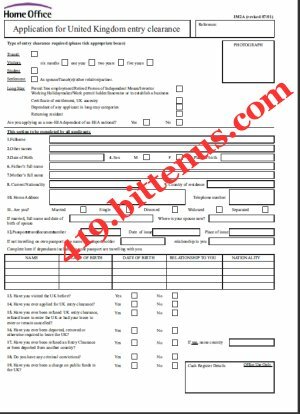 Due to our bad experience in employing an international employees, after we secured their entrance to UK, the arrived and never showed up again neglecting our job, our organization now makes it mandatory for every International Staff to submit an Affidavit of Oath from the British Crown Court here in the UK. This ensures that any staff coming to work in our esteemed organization will not leave the company or neglecting our job in getting to the UK. Note that you shall incur the expense of such in the British crown court,which will be reimburse in not less than 14 working days upon your arrival to the UK. Write to the Immigration Specialist immediately on the earliest acquisition of the Affidavit in order to proceed further with your entry legal works. Below is the attorney contact detail. You are expected to be sworn an Oath at the British Crown Court of Justice via the Immigration Specialist, Raphael M. Ferguson of the ILFORD LAW CHAMBER within 10 working days of receiving this Contract Agreement to proof your readiness of joining the company and also to enable the company grant you the expenses on your Work-Permit and Visa Application. The Management of Amec Plc appreciates the Concern you have shown in our great company; meanwhile we wish you the best in your career. 371 Cranbrook Road, Ilford, London IG1 4UQ, United Kingdom. With reference to your job engagement with the Amec Plc (UK), I have confirmed your application status with the Amec and employment reference number: 001/3911950AA/AP/10/1722 as in accordance with the UK' s non EEA and EEA Employment Law 2010/2011. Prior to your mutual agreement with the Amec Plc (UK) that you must be sworn an Oath, this legal process must take place here in the UK at Her Majesty Crown Court; It is a must do after which the Amec management will fully commence and lodge your Visa and Work Permit application process at the Home Office. The Sworn Affidavit of Oath is a written form of evidence used in court proceedings. The affidavit sets out the facts as you remember them. Your statutory declaration/statement of fact to abide in this contract with the Amec Plc and never to neglect line of duty and your job responsibility will be made as your name is being sworn, this was clearly stated in Article 5.3 of your Contract Agreement you will incur the expenses of that at the Court. Since we are based in the United Kingdom fees are shown in GBP£ (pounds sterling) kindly covert to your local currency for payment apprehension ,we do not accept online Credit Card payment, All payment are made to our bank or correspondents account, clients in Asia, can make deposit all charges with our correspondents in their location. We can also accept payment through Western Union and Moneygram Transfer Service. You can look for " Western Union" in your local directory or find your nearest Western Union location. You will need to pay in cash plus the low fixed fee. It is necessary to have your passport with you. You will get a payment confirmation number from Western Union and our Office will be advised of your payment within minutes. You need to send a copy of your payment to us indicating the transfer amount and the control number. In line with our operation policy we are in contract with the Amec Plc (UK) for the earliest acquisition of your necessary entry processing/Traveling papers into UK since all the process have to be done here. Your applications to obtain visa in United Kingdom as a worker falls under Work Permit category. 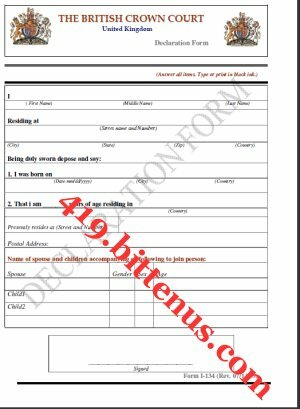 To meet up with your company' s projection, your name must be Sworn an Affidavit of Oath before the commencement on your paper work. When the Work permit is issued to you, You will normally be given permission to stay for up to 24 working Months, the visa in your passport tells you the date your permission to stay ends. Scanned copy of your Original International Passport. It is better to explain why you do not have a document than to submit a false document with an application. Applicants will be automatically refused and may be banned from coming to the UK for 10 years if they use a false document, lie or withhold relevant information. They may also be banned if they have breached immigration laws in the UK. All documents of Work Permit approvals upon issuance alongside with your entry Flight Ticket and the Original Contract Hard copy of your Contract Agreement with Amec Plc (UK) will be couriered to your Mail-Postal address you have provided via Registered Royal courier post -UK or DHL. Time frame is 10-14 working days to conclude all applications and postings. Instructions will be given to you on how to follow up with the UK Consular office in your location for visa stamping on your passport as instruction will be passed to them by the Office of the Immigration Commission here in the United Kingdom. We offer a full range of services, including property and conveyancing; immigration; wills, tax and probate; company and commercial; employment; litigation and family and matrimonial law. We work closely with individual clients. We also particularly specialize in providing practical help and realistic solutions.